Nationally known cycling attorney Bob Mionske will discuss bias against cyclists and cyclists' rights at events across the U.S. this spring. These events are part of Mionske's national tour in support of his new book Bicycling & the Law: Your Rights as a Cyclist. The book is a complete legal reference for cyclists confronted with questions about traffic law, harassment, theft, and other common issues. The American public lacks basic awareness of cyclists' rights. In fact, in much of the country, the roads are biased against bicycling. Yet more and more Americans are riding bicycles for fun, fitness, and transportation, in part because of the long-term rise in gasoline prices and recent attention to carbon emissions and global warming. Mionske's book Bicycling & the Law helps define the cyclist's legal right to the road and his national tour will raise awareness of this issue. Mionske is available for print, online, radio, and television interviews. To book an event with Mionske, please email bookbob2speak@gmail.com. Bicycling & the Law is available nationally in bookstores, bike shops, and online. Friday, February 29, 6 p.m.
Thursday, March 1, 5-8 p.m.
Monday, March 3, 8 p.m.
Wednesday, March 5, 9:30 a.m. and 6:30-8 p.m.
Register at bikeleague.org or call 202-822-1333 with questions. Friday, March 7, 7-9 p.m.
Bicycling & the Law: Your Rights as a Cyclist is designed to be the primary resource for cyclists to consult when confronted with a legal question. America's 57 million cyclists face the challenges of commuting in traffic, overenthusiastic dogs, road hazards, traffic codes, harassment, road rage, bicycle theft, group rides, and property damage. Bicycling & the Law provides readers with the knowledge to avoid many legal problems and informs them of their rights, their responsibilities, and their recourse if they are confronted with a legal problem. Bob Mionske makes the law both entertaining and understandable to the non-lawyer, while presenting an accurate and thorough explanation of the laws governing bicycles and bicycling. 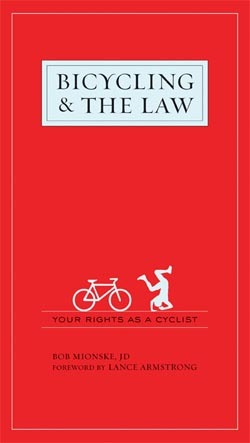 Bicycling & the Law is a definitive resource and the only book of its kind on the market. The book opens with a foreword by Lance Armstrong that details a frightening experience with cyclist harassment. The book has been endorsed by George Hincapie, Bobby Julich, Chris Carmichael, Bicycling magazine, and many cycling advocacy organizations including the League of American Bicyclists, the San Francisco Bicycle Coalition, ColoBikeLaw.com, the National Center for Bicycling & Walking, the Bicycle Transportation Institute, Bicycle Colorado, and advocates like Congressman James L. Oberstar. More information is available at velopress.com. Bob Mionske is a Doctor of Law with a private practice that focuses on issues confronting cyclists. Mionske is a regular columnist for VeloNews magazine and his popular "Legally Speaking with Bob Mionske" column is available on VeloNews.com. Mionske took fourth place in the 1988 Olympic Games cycling road race and was the 1990 U.S. National Road Race Champion. Mionske's legal practice is based in Portland, Oregon. More information is available at bicyclelaw.com.